Why is it that Ireland can boast the largest number of Nobel Prize winners in Literature per capita than any other country in the world? Seamus Heaney, Samuel Beckett, George Bernard Shaw & William Butler Yeats have each been awarded the most coveted prize in literature, and the following literary luminaries were all born in Ireland: Jonathan Swift, J.M. Synge, Sean O'Casey, James Joyce, Edna O'Brien & Bram Stoker! Many have argued that Ireland's marvelous tradition of storytelling contributes to the imagination & narrative skill of its countrymen & women. But I also like to think something else has given rise to the Emerald Isle's storytelling magic over the years—their enchanted worldview. And what would I know of such Irish enchantment? Plenty—for my mother was raised by my Irish great grandmother who'd grown up in Ireland & experienced the "old ways" long before Ireland had even achieved independence from Britain. Here is a picture of my great grandmother Margaret O'Hara on her wedding day in 1899. Note how very slim she appears (her raven-haired head is nearly as large as her waist! ), for Ireland was not long from the famine that had plagued the country in the 19th century. But along with her fondness for Irish lace & crystal, indomitable will hardened by persecution from the Protestant Orange Order, and extroardinary hospitality that is always a hallmark of Irish culture, Margaret O'Hara brought something else along with her to the United States: an animated view of the world that is deeply rooted in a belief in magic . . .
As a girl from a poor Catholic family, Margaret O'Hara grew up in what you & I would call an "Old World" stone cottage with a sandy floor & a fire-burning hearth where they cooked all their meals—and then told legends to whittle away the dark evening hours. And it was those stories that my great grandmother repeated to my own mother when she was a girl—tales of a fairy behind every bush, ghostly banshees who scream to let you know when someone will die, and a whole score of spells (with their accompanying holy oils) that needed to be cast to insure friendly weather & a good harvest of crops. Below is my very favorite photo of my great-grandmother and my mother walking hand in hand in a field during the Great Depression of the 1930s. It was a tough time in the United States, but though they had few material items to share, my great grandmother made up for it by telling my mother enchanted stories of every tree & flower & hill that coincided with Celtic myths & legends on their long walks together. For you see, to Margaret O'Hara, those legends wouldn't have been far away or long ago at all. To the ancient Celts & even the more modern Irish like Margaret O'Hara, time was once viewed as cyclical—a series of spirals that makes the legendary past always present and very alive. In current times, we tend to think of life as linear, with one event following after the other as though life passes by on a conveyor belt. But to the Celts, time has parallel dimensions that are not a line but are rather a circle or connection of spirals. “What lies beneath” might be a more appropriate catch phrase, because instead of viewing time as a swift moving stream, the Celts viewed it as more of a lake. We who are living now are simply leaves floating on the surface of that lake. But underneath us is a vast depth of All-Time filled with ancestral spirits & legendary figures who are still active in their realm—and that dimension has influence on us in the present day. 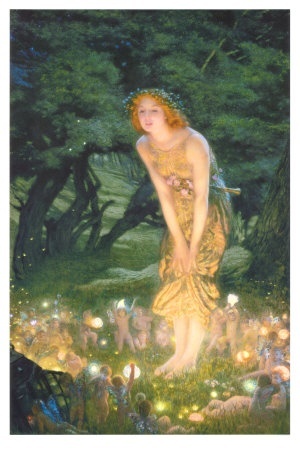 So that means the fairies of yesteryear continue to come out to play & to create mischief (especially on the Celtic holidays of Beltane & Samhain—May Day & Halloween). So you'd better know the right spells & biscuits to bake to keep the particularly naughty ones at bay! And to Margaret O'Hara, a sudden warm breeze & call of a bird just as shadows beneath trees start to mysteriously shift were all clear evidence of the fairies' activities. It goes without saying, of course, that you'd better be a good girl for Gram because if you weren't, you just might be given to the ragpicker—or even worse, to a roving band of unscrupulous fairies . . .
Did I happen to mention that no one could curse like my mother? Oh, she never swore or took the Lord's name in vain, but believe me, she could look you in the eye & utter an old Irish curse with such spellbinding venom that you'd think for certain all hell was about to rain on your head. "A pox on you!" she'd cry to someone who dared to steal her parking spot, "may you be fed hogwash and be boiled in oil." Or to the person who coldly swiped a bargain she was about to grab, "Crows' curse upon you," she'd grumble, "and the devil take your last shilling." 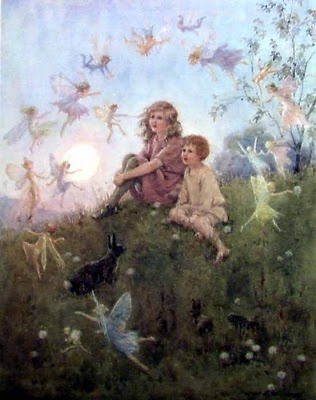 Far more common for her were the blessings, however—for I grew up believing there were helpful fairies & angels hovering as close as a breath, if only we had eyes to see them. "But we can always feel them with our hearts," my mother explained, "if we we stop long enough to listen"—and she was convinced that they were attracted by our laughter and joy . . .
Is it any wonder with such an animated worldview that I grew up to write books that feature magic & whimsy intersecting with every day life such as Twixt & Robin in the Hood? Like those Emerald Isle writers that came long before me, I too was influenced by an enchanted Irish worldview that made my mother's life full of possibility & miracles—and I'm so grateful that it gave me the courage to believe . . .
P.S. Since March is the month of Saint Patrick's Day, I just can't help but let you know about 2 new enchanting love potions/fragrances from Magickal Perfumerie that feature fairies & leprechauns. And yes, I ordered them myself! I don't receive kickbacks from this company at all—I just find their fragrances are so intoxicating & exquisite that I can't help sharing them with everyone. You can find their new fragrances at www.lovepotionperfume.com. Enjoy! 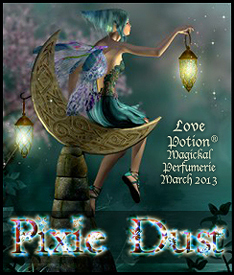 Pixie Dust Fragrance Description: Where the tall trees stand like sentinels upon the land, guarding those sacred & secret places known only to the Fae . . . the Sun has returned to the world & lain its golden warmth upon the land & the Pixies rejoice in the coming of light & scatter their delicate magic upon everything they see. Their trilling chorus of exultation awakens the birds & the flowers to herald another season of creation & the blooms which burst forth in so much chromatic glory are the surest sign that Spring is come. We can all now turn our faces to the light & smile in its beneficence . . .
WISTERIA ~ Welcoming of new person into your life. Youth, eloquence. LILAC ~ Inspires peace and harmony, humility, youthfulness, protection. HELIOTROPE ~ Clairvoyance, healing, protection, wealth, exorcism, invisibility. MUSK ~ Self confidence and strength, sexual attractant, heightens passions and arousal. 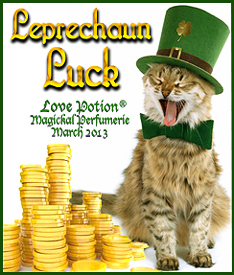 Leprechaun Luck Fragrance Description: Golden honeysuckle blossoms will show you the money, especially when dipped in a light sweet honey, given a spritz of shiny lemon, and topped with a dollop of sweetened whipped cream and a dash of warm ginger. And because wealth attracts wealth, we’ve included a sparkly swirl of 24kt gold leaf inside every bottle! HONEYSUCKLE ~ Bonds of love, generosity; attracts money, prosperity, clairvoyance, healing, creativity, protection. HONEY ~ Enticing, seductive; use to bewitch a straying or hesitant lover. Happiness, fulfillment. LEMON ~ Energizing, uplifting. Longevity, faithfulness, fidelity, friendship. Used to attract spirits. MILK/BUTTER/CREAM ~ Nurturing, soothing, eases troubled relationships. Goddess energy. 24kt GOLD ~ Gold is masculine in energy and a representation of the sun. It's energy is projective and aggressive, and represents wealth and prosperity. Thanks for sharing this glimpse of finding beauty and magic even in hardship! It really does shine through in your books, too. What a magical article! Thank you for sharing this glimpse into your childhood and the magic you grew up with. I can see how your books are filled with such enchantment and heart. Thanks, Brie! It's such a joy to share these memories with everyone & the magic my mother & great grandmother imparted. I got to meet her when she was well into her 90s—such a blessing! Diane, I love the whole essay! And the part about your Mother "Cursing" Spellbinding Irish curses with Venom! I have one of those Irish Mothers!! :) guess what, the perfume is SOLD OUT! I am sure, due in part to your blog! Let me know how you like it!! 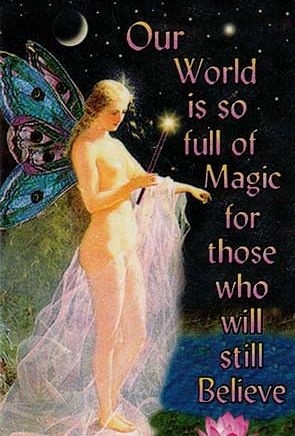 Thanks for the Magic you bring to us! I'm in agreement with everyone else...loved this post. 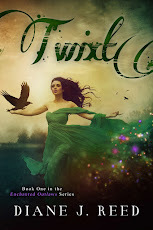 It is so easy to revisit Twixt in your memories of your family which makes it an even more special book to me. Thanks for sharing! I am a new fan! You have won me heart and soul! What beauty you create with your words! I can close my eyes and go back to what I've read and picture it perfectly! What a gift you have! I have pinned you on pinterest. You are my first...I think...I am new to all of that still! Anyway, have you tried these two new scents? They sound delicious! Could you please let us know? Aw, how very kind of you! I haven't gotten the fragrances in the mail yet, but the minute I do I'll let you know : ). And I'm so happy to welcome you to Bandits Ranch!